The 40” interactive panel PN40TC1 offers a fresh approach to boosting the dynamism of business and educational organisations. It is ideal for meetings of two to six people held in small spaces—the so-called “huddle spaces” where a high proportion of meetings take place in the modern world. Making the most of huddle meetings can transform communications and accelerate business to a whole new level. 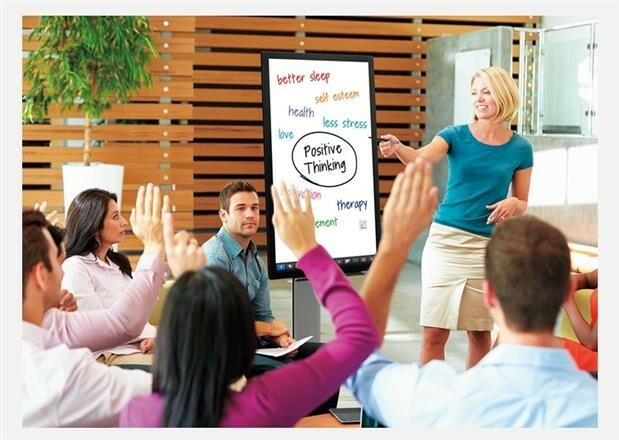 Ideal for small meetings in "huddle spaces"
touchscreen operation, whether with a finger or pen, facilitates active collaborations and a lively exchange of opinions. And with the optional wireless board, you can also have BYOD meetings. Speedy, productive collaborations become a reality. The PN40TC1 employs a full-flat design with 10-point multi-touch functionality. With Sharp’s original capacitive touch technology, the PN40TC1 offers extremely precise and smooth operation. The bundled 2 mm-tip touch pen facilitates communication by supporting smooth and accurate onscreen writing of fine text and lines. An onscreen touch menu lets you easily switch inputs, change between touch and pen modes, and access other frequently used functions. The easy-to-launch SHARP Pen Software user interface incorporates a menu comprising smartly arranged icons that provide easy access to pen settings and other useful functions. In overlay mode, you can write onscreen annotations or graphics directly onto photos, videos, PDFs, and common Microsoft® files.